After the decline of the Sangam Age in the Tamil country, the Kalabhra rule lasted for about 250 years. Thereafter, the Pallavas established their kingdom in Tondaimandalam with its capital at Kanchipuram. Their rule continued till Tondaimandalam was captured and annexed by the Imperial Cholas in the beginning of the tenth century A.D. There are many disputes regarding the origin of Pallavas. Their antecedents are unknown. Some historians maintain that their origin could be traced to the Pahlava (Parthians) of northwestern India. But it is more likely that their name is derived from the Sanskrit equivalent (Pallava means ‘leaves’,’foliage’) of the Tamil word “Tondai” which designates their original domain, Tondaimandalam. On the other hand, there is a legend that the first Pallava was a stranger who married a native Naga princess. The Nagas are symbols of fertility and indigenous power. 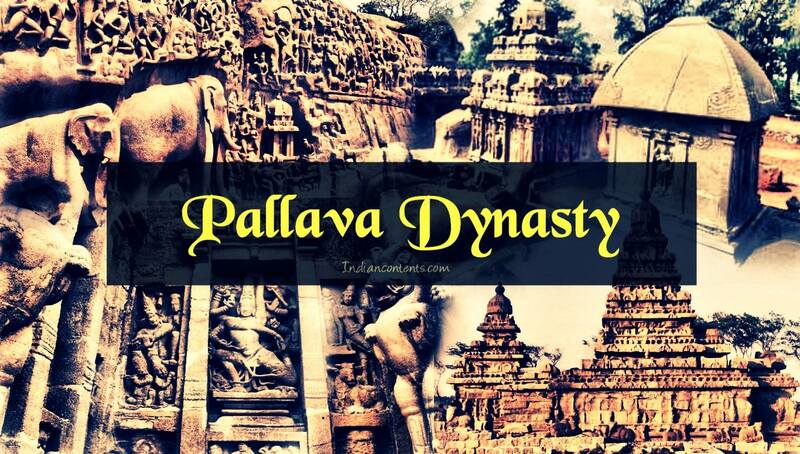 Another view was that the Pallavas were a branch of the Brahmin royal dynasty of the Vakatakas of the Deccan. Even the language of Pallavas was not certain. Some inscriptions stone indicates that the court language of the Pallavas, which in Andhra was at first Prakrit, changed to Sanskrit. Later, in the Kanchi area, from around the sixth century, Tamil began to be used more often. The Pallavas were the first South Indian dynasty which succeeded in extending the political control and administrating it effectively. The early Pallava rulers from 250 A.D. to 350 A.D. issued their charters in Prakrit. Sivaskandavarman and Vijayaskandavarman were significant among them. The second line of Pallava rulers who governed between 350 A.D. what's more, 550 A.D. issued their contracts in Sanskrit. The most vital ruler of this line was Vishnugopal who was vanquished by Samudragupta during his South Indian endeavor. The leaders of the third line who ruled from 575 A.D. to their definitive fall in the ninth century issued their charters both in Sanskrit and Tamil. Simhavishnu was the first ruler of this line. He demolished the Kalabhras and immovably settled the Pallava administer in Tondaimandalam. He also crushed the Cholas and stretched out the Pallava region up to the river Kaveri. Other incredible Pallava leaders of this line were Mahendravarman I, Narasimhavarman I, and Narasimhavarman II. Pallavas maintained a well-organized administrative system. Pallava state was divided into Kottams. Again Kottam was administered by officers appointed by the king. The king was at the center of administration in which he was assisted by able ministers. He was the fountain of justice. He maintained a well-trained army. He provided land-grants to the temples known as Devadhana and also to the Brahmans known as Brahmadeya. It was also the responsibility of the central government to provide irrigation facilities to the lands. A number of irrigation tanks were dug by the Pallava kings. The irrigation tanks at Mahendravadi and Mamandoor were dug during the reign of Mahendravarman I. Detailed information on the tax system could also be traced from the Pallava inscriptions. The land tax was the primary source of the government revenue. The Brahmadeya and Devadhana lands were exempted from tax. Traders and artisans such as carpenters, goldsmiths, washer-men, oil-pressers, and weavers paid taxes to the government. The Pallava inscriptions throw much light on the village assemblies called Sabhas and their committees. They maintained records of all village lands, looked after local affairs and managed temples. Kanchi was a great ancient center of learning. The founder of the Kadamba dynasty, Mayurasarman studied Vedas at Kanchi. Dinganaga, a Buddhist writer came to study at Kanchi. Dharmapala, who later became the Head of the Nalanda University, belonged to Kanchi. Bharavi, the great Sanskrit scholar lived in the time of Simhavishnu. Dandin, another Sanskrit writer adorned the court of Narasimhavarman II. Mahendravaraman I composed the Sanskrit play Mattavilasaprahasanam. Tamil literature had also developed. The Nayanmars and Alwars composed religious hymns in Tamil. The Devaram composed by Nayanmars and the Nalayradivyaprabandam composed by Alwars represent the religious literature of the Pallava period. Perundevanar was patronized by Nandivarman II and he translated the Mahabharata as Bharathavenba in Tamil. Nandikkalambagam was another important work but the name of the author of this work is not known. Music and dance also developed during this period. The rulers of Pallava Kingdom were not only great soldiers but also very great patrons of Art and Architecture. 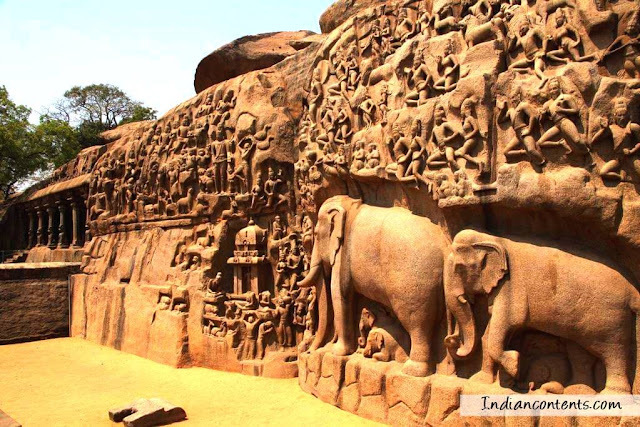 The monuments at Mamallapuram are among the oldest remaining ones in South India. They are rock temples and sculptures created under the patronage of kings of the Pallava dynasty in the sixth to eighth centuries, A.D. king Mahendra cave temple at Mamandur is another fine work of Pallavas. Mahendra’s legacy of cave-temples provides us with the earliest documented rock-cut architecture in the Tamil country. His inscriptions engraved on the stone walls of several of his cave-temples have survived and proclaimed his authorship through the use of his royal name and titles. Mahendra’s cave-temples are characterized by plain, massive, square-sectioned pillars with an octagonally chamfered middle portion. Generally speaking, the only sculptured figures in these cave-temples are door guardians, though the walls of these shrines must have been originally plastered and painted with figures illustrating religious themes. These paintings have eroded away over the centuries. Fortunately, in one of Mahendra’s last cave-temples, the one which is excavated near the top of the Rock-Fort Hill, Tiruchirapalli, there is a splendid carving in relief of Shiva-Gangadhara on the western wall of its porch. This masterpiece demonstrates the excellence of Pallava sculpture in Mahendra’s day. King Mahamalla created something unprecedented in the Tamil country when his artisans carved whole temples out of solid rock masses. 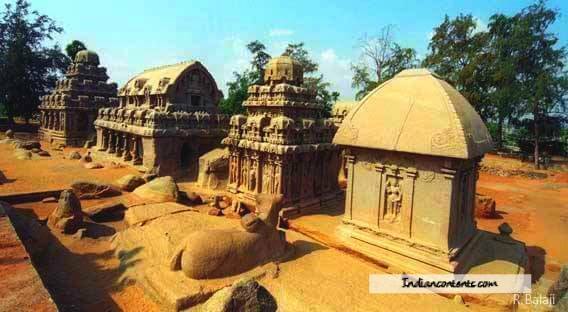 The Five Rathas of Mamallapuram are the best examples of these monolithic shrines. The Great Penance Panel at Mamallapuram is another unique creation of Mahamalla’s. This expansive open-air relief carving remains unparalleled in world art. The King Narasimha-II devoted himself mainly to the building of structural temples, using stone blocks. The twin towers of the Shore Temple are his creation. Other important structural stone temples built by him are at Panamalai and Kanchi. His Kailasanatha Temple, Kanchi, is a vast treasure-house of Pallava art.